Yes, most granola is not exactly healthy, even though its easy to think it is. Grains, nuts, fruits, its good for you right? Uh-huh. Look at the nutrition stats and serving sizes, and realized that your "health food" isn't exactly that. There are a slew of companies trying to make healthier granola though, less sugar added, not loaded with oils, non-GMO, etc. gr8nola is one of those companies. "We're redefining granola for the modern, health-conscious consumer. Discover the gr8ness inside every bite!" gr8nola uses whole grain oats, extra virgin coconut oil, and other goodies like flaxseed (fiber! omega-3s! ), sunflower seeds (vitamin E! ), coconut (unsweetened of course, for iron and fiber! ), turmeric (anti-inflammatory! ), etc, etc. All good things, but, I'm kinda more about taste than uber focused on nutrition. I didn't actually know this, but gr8nola launched into success back in 2014, when invited to the Google microkitchen fair (where employees trial products and vote on what to have in our little micro kitchens). I'm not sure if I attended that year, or if I tried the granola, but, it won, and has been featured in some of our campus since (not the one I work in though). Yadda, yadda, scaled up production, now at lots of Bay Area campus, etc, etc. But none of that is how I discovered gr8nola. I recently won a contest (!) and little bags of gr8nola were part of my winnings. I do sometimes get really, really hooked on granola (like the kind they have at the Sheraton on the Park in Sydney, I'm seriously obsessed! ), so I was eager to try it out. The granola now comes in 4 varieties: origina, "coco cacao", golden turmeric, and matcha green tea, I was provided with only the original. I appreciated the portion controlled, re-sealable packaging. All varieties lack clusters. 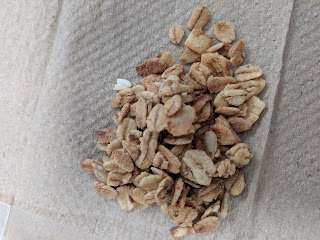 I know this is a style thing, but since I like to use granola as a finger snack food, I like having clusters. This style was more suited for sprinkling on top of yogurt. "Our signature flavor. Whole grain oats, heart-healthy almonds, ground flaxseed and delectable honey for the perfect touch of sweetness. 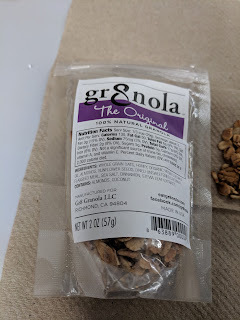 Whether eaten with milk, on top of yogurt, smoothies or straight out of the bag, gr8nola is a smart, simple way to add crunch, flavor, fiber and nutrition to your diet." I didn't find this very munchable from the bag. First, as I said, no clusters, but also, it just was very ... homogeneous. No large chunks of nuts, seeds, or fruits to go for. The flavor wasn't plain however, it was heavily cinnamon spiced. A bit much, really. I'm personally not a fan of sunflower nor flax seeds, which were also in the mix. But the dominant flavor? Stevia. It tasted artificially sweetened. I know the goal is low sugar, and I use artificial sweetener myself, but, this was too much. I tried with milk, and it was better, but I think it would be best suited for a topping on a fruit crumble, where the cinnamon would be a more natural element. Even then though, you need to want the Stevia taste. Healthy ice cream. One of the latest food trends. One I've had very little interest in. Years ago, I did go through a "healthy" phase, where I did care about fats and calorie counts, and I remember discovering Arctic Zero (it was brand new on the market at the time), and I was so excited. It sounded too good to be true. 200-400 calories in ... an entire pint?! Full of protein? OMG. And then I tried it. It was not creamy, it didn't really resemble ice cream, and, well, I didn't try any other products in this market for years, even though it has been a hot market. I like creamy, high fat, actually tasty ice cream just too much. But I was given the opportunity to try Enlightened bars, so I figured I'd give the concept another try. Enlightened makes "Good-for-you" ice cream, available in pints and novelty bars. 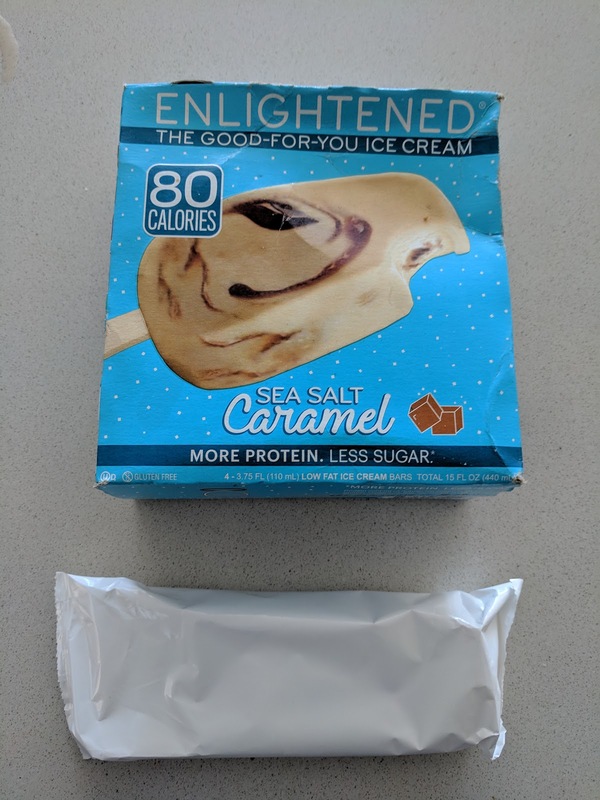 Same concept at Halo Top and the like, <100 calories per serving / 400 calories per pint, high protein, low sugar. In Enlightened's case, it is actually made with dairy. And I'll be honest, some of the flavors, particularly for pints, sound great: "Movie Night", popcorn ice cream with chocolate bits and caramel swirl? Marshmallow Peanut Butter? French Toast? Glazed Donut? Bananas Foster? Yes, please! They also, of course, make all your classics, chocolate, vanilla, etc, etc, and all the "modern classics" like sea salt caramel, birthday cake, cold brew coffee, and more. Plus bars, in many of the same flavors. It was a bar I was able to try, along with many co-workers. We were decently impressed, but I still won't go purchase these. The bars come 4 to a box, individually wrapped. We tried the Sea Salt Caramel flavor. "Salty this ice cream is prettier than you’ll ever be? One bite and all will be forgiven. Silky ribbons of caramel swirl threaded through sea salt caramel ice cream." At first glance, it fared pretty well. It did have a lovely swirl on it! It was actually better than I imagined, although it was more finicky than regular ice cream, texture wise. You definitely needed to let it soften up, more than normal ice cream (which is always *better* soft, but isn't necessary). You also needed to lick it rather than bite it, again, more than regular ice cream, as biting into it made it come across as grainy. But when it was melty, and soft, and you licked it, it was creamy and smooth, nearly like normal ice cream. 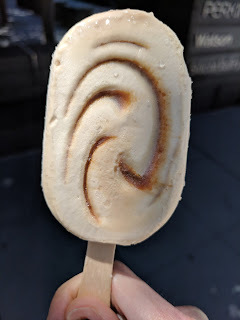 The ice cream had a slight sweetness to it, more interesting than a plain vanilla, but not strong in the caramel. The caramel ribbons were really tasty, sweet, and gooey, in a way that added some interesting contrast. 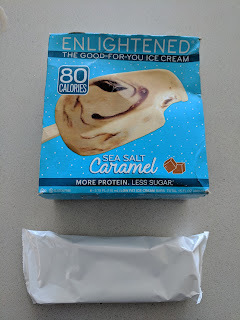 It wasn't a decadent normal ice cream at all, but for 80 calories, 1.5 grams of fat, 5 grams of sugar, and 7 grams of protein it would be crazy to pass this up if you are concerned with reasonable ice cream choices! I normally fly with One World airlines when I do international travel from SFO, but for a recent trip through London, I went with Virgin Atlantic, because it was much more affordable (and, honestly, I wanted to try something new). 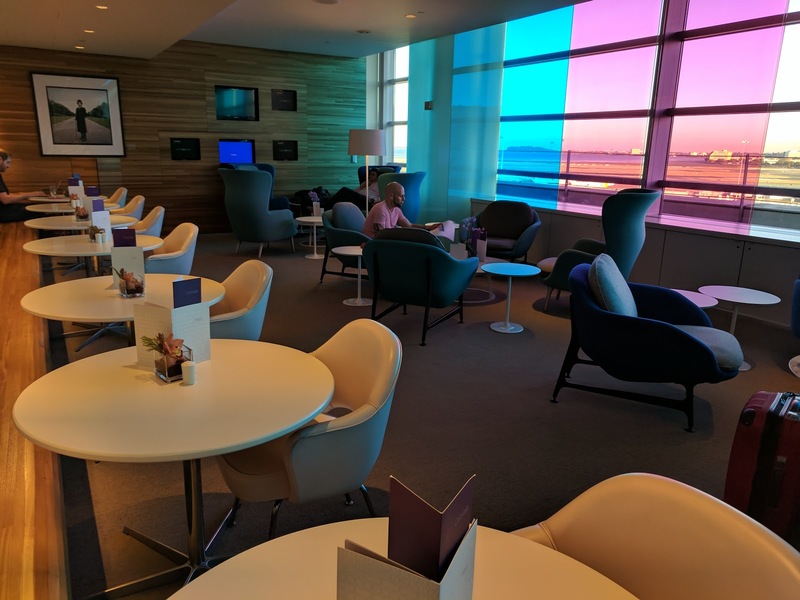 This was my first time flying with Virgin Atlantic, and my first time visiting any of their lounges, er, Clubhouses. I must say, I was impressed. 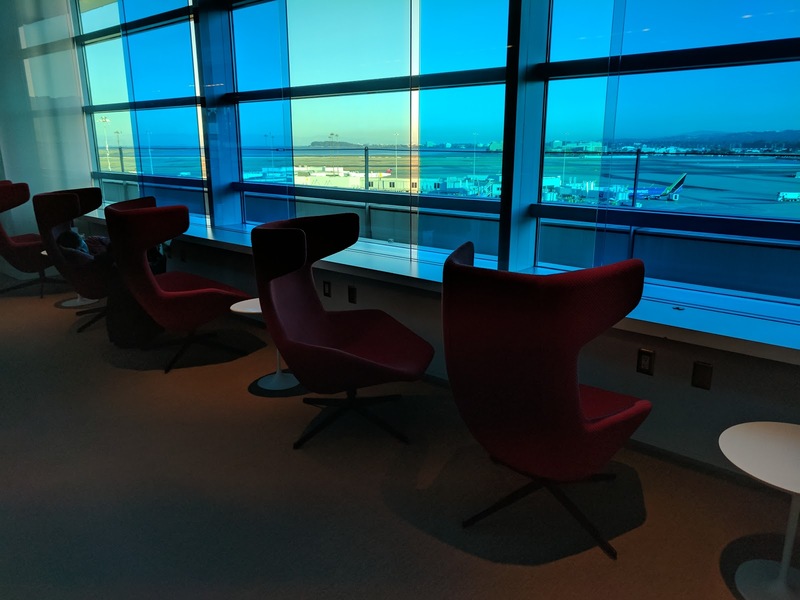 It wasn't anything like the ridiculous Cathay Pacific lounges in Hong Kong or the Qantas First Class lounge in Sydney, but, it blows every other lounge in SFO away, in nearly every dimension: comfort, decor, not too busy, good food (made to order), great drinks ... the only downside? It is landside. Ooph. Ojan and I arrived around 6:30pm for our 9:10pm flight. We knew this was early, but, we wanted to have a nice relaxed meal in the lounge at a more normal hour, so we could mostly skip the meal on board, knowing it would be served close to 11pm, and that there is no way it would be as good as the made-to-order cuisine served in the Clubhouse. 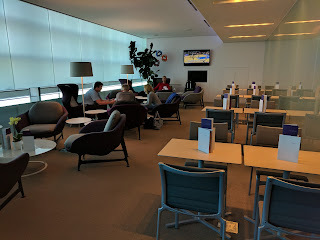 Yup, full service restaurant in the SFO Clubhouse, radically better than anything other SFO based lounges offer (I'm looking at you crappy One World lounges with only pre-made sandwiches! Since the lounge is landside, we needed to allow even more time to visit the lounge, in addition to wanting time for a full meal. So, we just went on the early side, planning to not rush, eat a full meal, get some work done, and then eventually head through security. This turned out to be a lovely plan, as the lounge had only a handful of other guests when we arrived. It very quickly filled up, as guests clearly like to take advantage of the Clubhouse, pre-security and all. They did make an announcement before our boarding time to warn those who wanted to purchase anything inside security that they should leave then, which we did, so we could grab some gum and take our time. Given that we didn't have TSA-Pre for this flight, it was a good thing, as security took a while, and we basically just walked onto the plane moments after purchasing our gum. Anyway, the lounge had a great vibe to it, was light filled, had a plethora of seating options, and was full of color. Anyway, back to the lounge. Seating was quite varied, with regular square dining tables and chairs, or more comfortable living-room style chairs arranged around round coffee tables. The living room feel continued with the floor lambs and small side tables. There were vases with fresh flowers on most tables. The large windows had comfy looking red wing chairs along them, which quickly became full. By the time we finished our meal at a regular table and set out to relocate to somewhere more comfortable, they were all full. 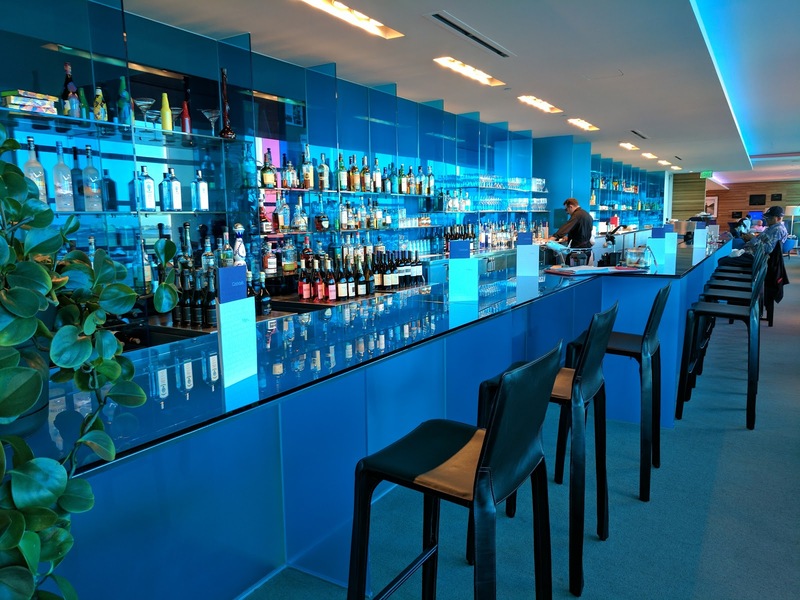 The bar was stunning, and featured counter stools for seating for those who wished a higher perch. The final area was more dining area, this time with round tables, comfy white leather chairs, and a wooden bench all along the wall. You really had your choice of any style of seating you preferred. Here you can see the colored glass windows, with panes tinted shades of blue and purple. 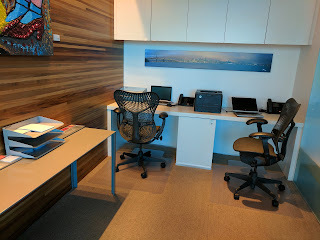 The totally unused business center had a couple computers and a printer, and was located in a little alcove on the side. Food and drinks are all ordered from servers, who circulate the room regularly. There is no buffet, no snack station, not even little nibbles on the side. You can order from any of the seating areas, and menus are located on every table. 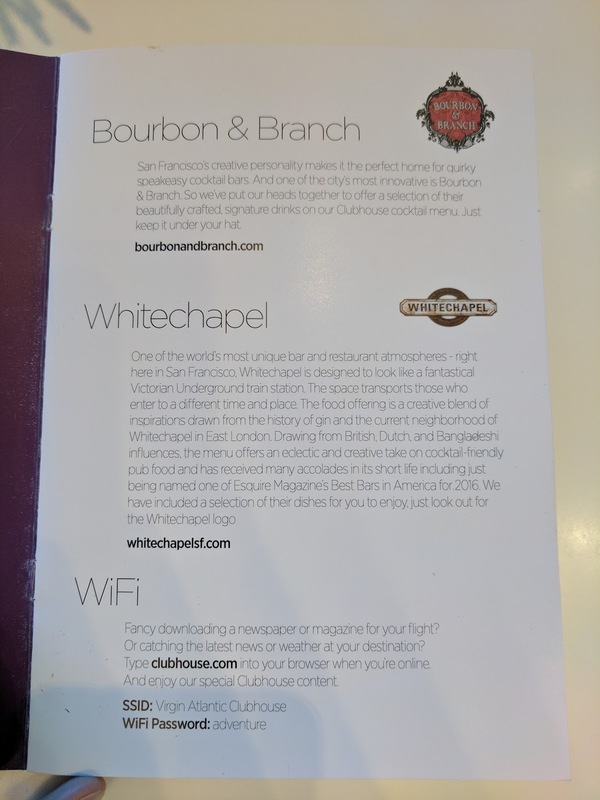 The first page of the menu calls out their unique partnerships with local establishments, like Whitechapel for the food, and Bourbon & Branch for the cocktails. The drink menu is impressive, matching the grandeur of the bar itself. They partner with a local bar, Bourbon & Branch, for the cocktails, and feature tons of local beers and wines. There was a wine list (including Mumm! and 4 different dessert wines), local beers (21st Amendment and Anchor Brewing Company), juices, smoothies, soft drinks, and ... a huge cocktail menu. 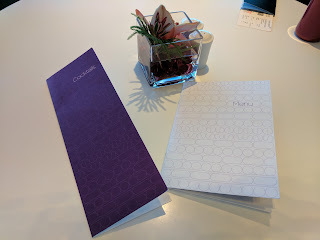 The cocktail menu had at least 20 cocktails, half of which are Bourbon & Branch classics, the others are standard cocktails (tom collins, bloody mary, dirty martini, etc), and finally a few Virgin Atlantic classics. It was hard to pick one, and my server was full of recommendations. Amusingly, she told me that the cucumber gimlet was very popular. When I said, "hmm, I don't really like cucumber drinks", she got very animated, and told me she totally agreed, but had to recommend it because it is so popular. She said she cringed whenever people order it. Lols. She quickly started pointing me towards the bourbon section of the menu, her favorites. "Buffalo Trace, Laphroaig Quarter Cask, walnut & pear liqueur bitters. Stirred." This drink is on the menu at Bourbon & Branch, and mentioned on "The Big Drink SF" list too. It was lovely. 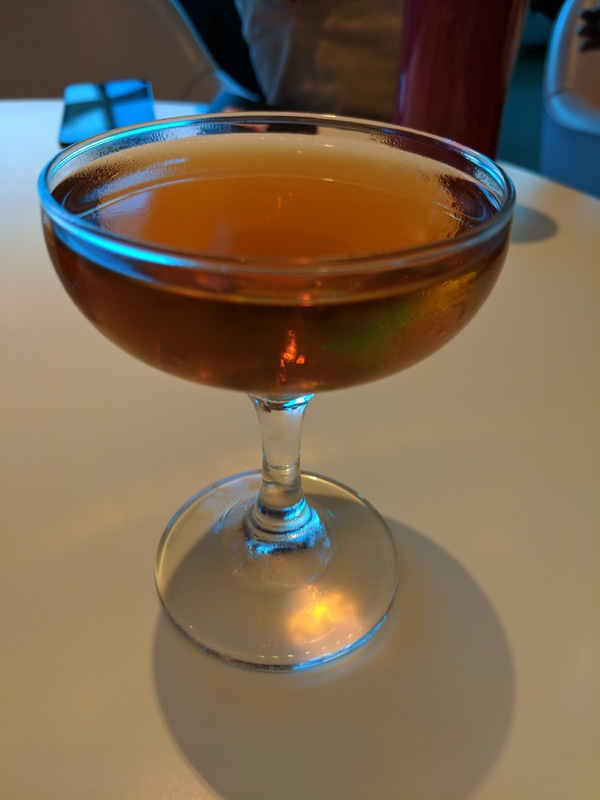 A mellow drink to sip, really well balanced, smooth, and *way* too drinkable for a drink that was entirely bourbon, whiskey, and liquor. I finished it way too quickly, and opted not to go for another cocktail, for my own good. But I really enjoyed it. My notes read, "yum!" Like the drink menu, the food offerings have a local touch too, with some items from Whitechapel. The menu is broken into starters, mains, salads, and desserts. There were a slew of dishes that sounded good, it was hard to narrow it down to just a few selections, particularly as we knew we'd have a full meal on the flight soon. We opted for one starter, one salad, and two entrees. Sadly, the dessert menu only had fruit salad, a cheese platter, sorbet, and a chocolate pot de creme, none of which I wanted. Perhaps they saved me from myself, its not like I went hungry. For a starter, we went with the Bitterballen, mostly because it sounded the most unique. This was a Whitechapel dish. Other options were a cream of artichoke soup (meh), sweet pea bruschetta (maybe good), and "Henge fries", another Whitechapel dish that I certainly would have ordered if I needed something more, as it included green garlic and serrano aioli. I was pretty blown away when it was delivered to our table. I wasn’t expecting presentation like this in a lounge! The wooden board, with a slot in it for the little bowl of mustard with cornichons, and a slot for the copper (?) 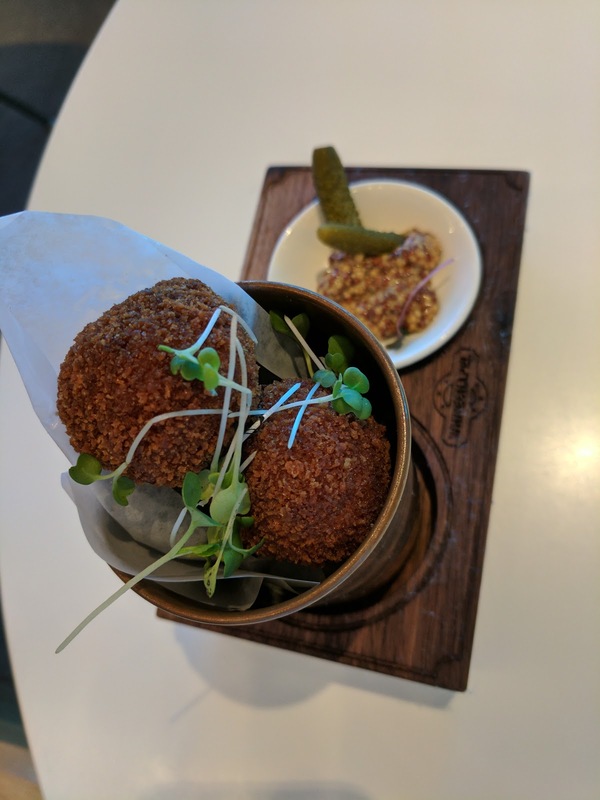 pot with the fried balls inside. The order came with 3 balls, all super hot, freshly fried. Ojan took the first one as I was taking notes, bit in, and told me it was hot. I was glad I waited a few minutes. He also told me I wouldn’t like it. He was right. On the plus side, it was super crispy, and I liked how crunchy it was. But, it was just too porky for me. Great presentation, unique dish, but, not for me. Interestingly, Ojan didn’t like it either, and when I asked why, he said that he just didn’t like anything about it. Clubhouse Burger, with Cheese, Chips. One minute after the Bitterballen arrived came Ojan’s main dish, the burger. 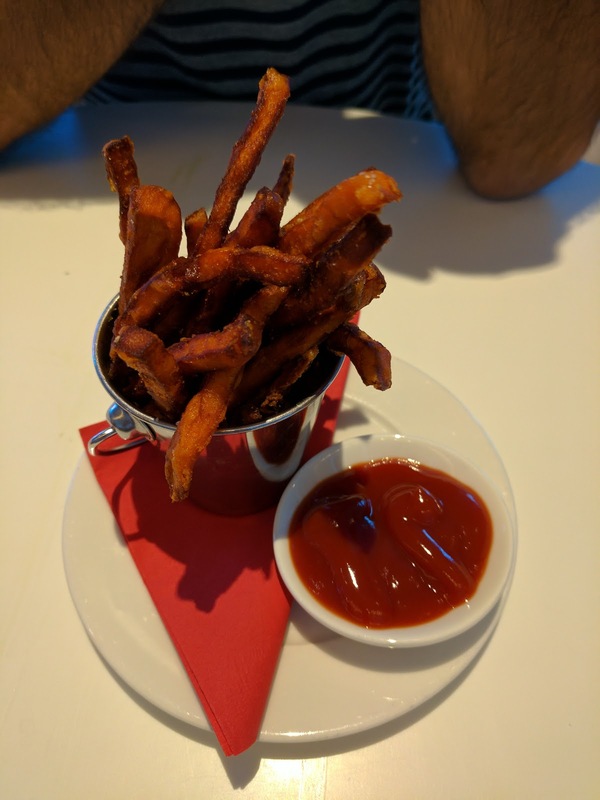 It was offered with regular or sweet potato fries. We ordered sweet potato, and received regular. No option for level of doneness was offered. He was asked if he wanted cheese, but, it wasn’t clear what kind. 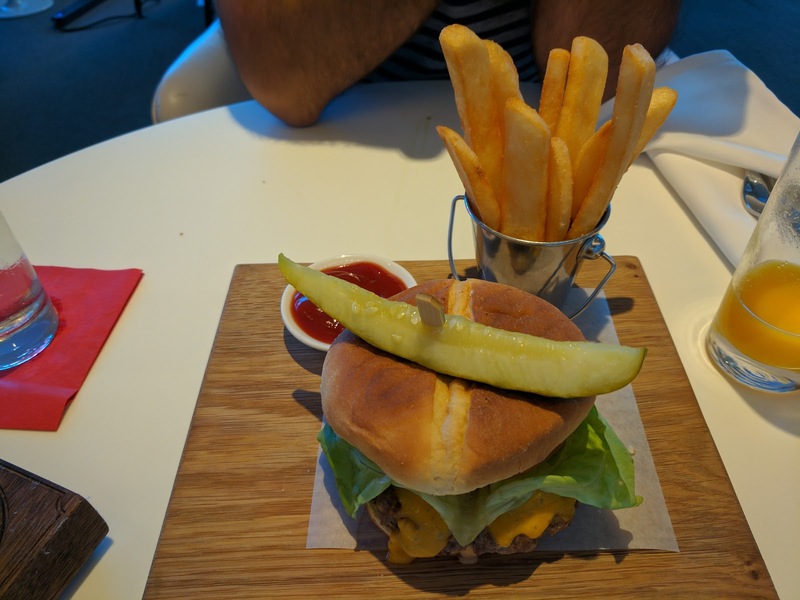 Presentation was again quite nice, served on a wooden platter, the fries in a metal pot. The pickle was a full spear, staked on top. The burger wasn’t quite as described. I lifted the bun to add ketchup and discovered that it had some kind of special sauce. I won’t complain about mayo sauce on a burger, so that was great, but, interesting that it wasn’t listed on the menu. But even more interesting? Two onion rings, also right under the bun top. I grabbed one immediately, Ojan scowled at me. I shouldn’t have grabbed it, as it was …. cold. And a bit soggy. Why did this burger have cold soggy onion rings on top? The burger was crazy well done, as in, way too cooked. Or, as Ojan put it, “cardboard level of overcooked.” The patty was thin, not juicy, not seasoned, and really didn’t taste like anything. The cheese was nicely melted. The tomato looked a bit anemic. The special sauce was tasty enough. Overall, not a good burger, and after a couple bites, Ojan pushed it aside. The fries error turned out to be in Ojan’s favor, as he wanted the regular ones anyway, it was me who wanted the sweet potato fries. A little bowl of ketchup was served on the side. I still snagged a fry while I waited for my entree, assuming it was coming soon. The fries were thick, crispy, and ridiculously hot. Clearly very fresh. They maintained their heat for an incredibly long time. Ojan loved them, I thought they were ok, but, not really what I wanted. "Crispy red onion and black olive tapanade." Ojan also wanted a salad. Salads are available as starter size, or main courses, topped with proteins like chicken. Other choices were a green salad with truffle dressing, caesar, and "shaved summer salad". He loves Greek salads though, so, that is what he ordered. It arrived after his burger, a good 5 minutes later. The timing and pacing of this meal was very strange. The starter came quickly. The burger not long behind. It took at least 10 minutes however for my entree to show up, and the salad came after the burger? As with all the dishes, presentation was quite nice. 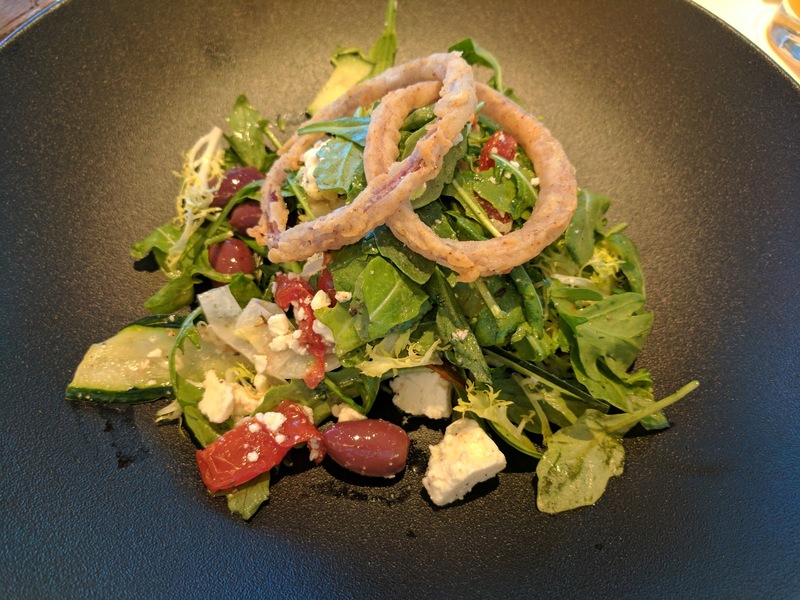 This was most certainly not a classic Greek salad. The description did mention that it would have “crispy red onion” and “black olive tapenade”, which should have been an indicator that it wasn’t going to be quite as expected. Anyway, what did we have here? An assortment of greens, including frisee and arugula. Shaved fennel. Shaved cucumber ribbons. Confit tomatoes. Yes, it did have olives and feta, which were about the only elements recognizable as a Greek salad. Since I don’t actually care for Greek salad, this seemed like an improvement to me over the classic, so, even though I didn’t plan to have any, I tried a few bites. Mostly out of boredom, as my food was yet to arrive, and I didn’t like the other starter. I liked the confit tomatoes, flavorful, soft, likely slow roasted. I may have stolen most of them. I also immediately stole one of the two crispy red onions on top, only to realize that, like in the burger, well, stone cold onion rings aren’t tasty. They weren’t really crispy either, they were battered, and had been fried at some point, but were really just cold old onion rings. Not a winning element. Ojan wasn’t very excited about this fancy Greek salad. “I wanted a normal Greek salad!”, he pouted. When I pointed out to the server that we had ordered sweet potato fries, we were asked if we still wanted them. Given that I didn’t like the starter, I quickly said yes, even though Ojan didn’t want them. They arrived 10 minutes later. I’m very glad I asked for them. They were awesome. Like the regular fries, they were delivered piping hot and fresh. Seriously, right out of the fryer! They really did a great job delivering fried items as soon as they were ready. Unlike the regular fries, these were a thin style. They were super crispy, I think battered in some way? They had a nice sweet potato flavor. They were served with ketchup, and I would have liked something else, like a honey mustard, or even the special sauce from the burger, but, still, very good. I devoured the entire pot. Ojan didn’t even get one. He was done eating at this point anyway. These were really, truly great sweet potato fries, and the best I’ve had in years. Finally, finally, 10 minutes after Ojan’s, my dish arrived. It was … really unique. Presentation-wise, on the plus side, it too was served on a wooden plater, with a special area for the hot cast iron with the cheese inside. But, on the minus side the “naan” was strangely torn into chunks along the side. I felt my inner Gordon Ramsey coming out, thinking it looked like something someone else discarded. It really was not appealing. 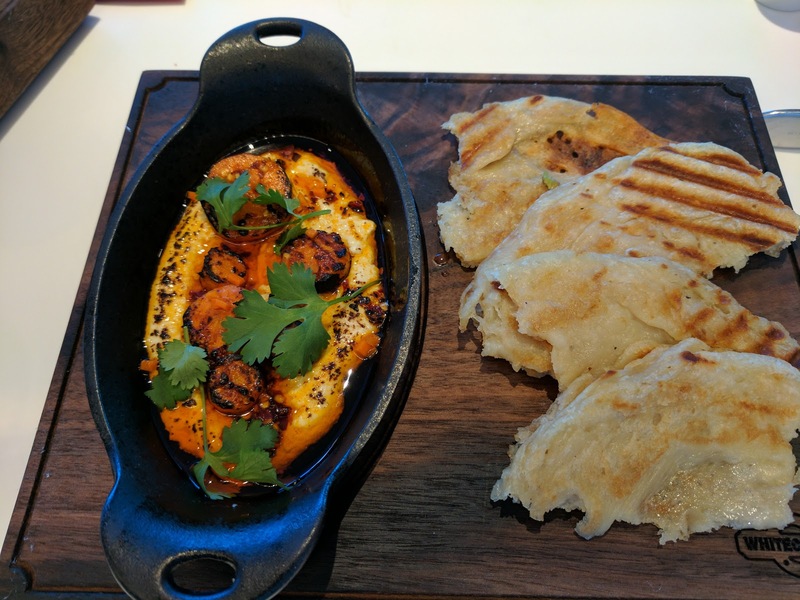 Anyway, the “naan” also wasn’t really naan. It was almost really good though, a bit dense and doughy, a bit crispy, nice grilled flavor, slight char on top. But it was crazy oily. The greasy level ruined it unfortunately. The chili oil was fascinating. It was very spicy. This dish had some serious kick. And there was tons of the oil. At first, I’ll admit, it looked crazy. Cheese in a big pool of oil? But, the oil worked as a dip for the bread, and I found myself dipping the already greasy bread into the oil and almost enjoying it. It really would have been better if the bread wasn’t as greasy! I also enjoyed dipping the sweet potato fries into the spicy oil. And finally, uh, carrots. Disks of carrot, nicely cooked, not mushy. They were charred and had a nice smokiness. The cheese was also charred on top. This was a really fascinating dish. Grilled naan, soft cheese, spicy oil, and charred carrots? It didn’t make sense, but, it almost really worked. Good flavors, good textures. I liked many aspects of it, and really, had the bread just not been as greasy, I really would have loved it. 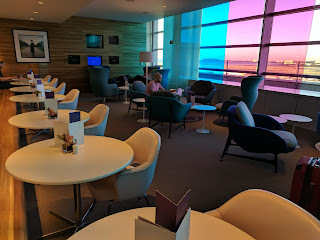 Still, very unique, and not at all what I’d expect in an airline lounge. Not quite a main dish, but, with our food, and an upcoming meal on the flight, it was more than enough. I finally, finally went to Pret a Manger. After walking by a zillion times, on nearly every street in London. Why? Because I attended an evening reception for a conference I was at, and they had the nerve to not serve dessert (!). My sweet tooth needed something. And Pret was on the way back to the hotel. Anyway. They have locations in other places now, including in the US (Boston, New York, Chicago, DC), and a few other countries, but the majority of the stores are still in the UK. Pret's Mince Pie: Mature Mincemeat / Shortcrust Pastry / Icing Sugar . 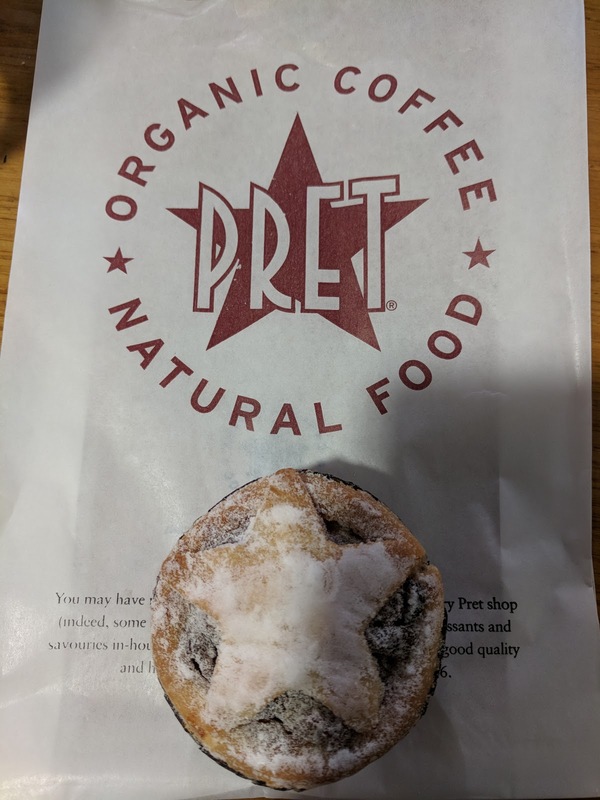 "Handmade in Yorkshire, Pret’s Mince Pies are made in small batches to a traditional recipe. The mincemeat was made in July and has been gathering flavour ever since. Topped with a Pret star and a dusting of icing sugar, these pies are a classic festive treat." Mince pie. Uh-huh, I know. Why would I get mince pie of all things? I think it was marketing, after days of setting mince pies on colorful signs out front of nearly every shop. Nero. Pret. M&S. Everywhere was advertising the mince pies, along with gingerbread this and that. 'Twas the season. I can't say that I have much of a history with mince pies. I think the only ones I really ever had were in Sydney, at the Sheraton on the Park, where they were the best of the mediocre desserts. And they were made better by whipped cream. But I also don't really have many chances to get mince pie. Our Starbucks, Peets, etc are certainly not advertising them in the way the British do! I got the last one. Oooh, they are popular! The cashier even said, "You get the last one! Your lucky day!" The pie was ... well, ok. Not great. The crust was shortcrust, better than a tart shell, softer, buttery-er, sweeter, but still not as good as real pie crust. More like a soft shortbread cookie. It was ok. The star on top was made of the same crust I believe, and was my favorite part. Sorta sweet, buttery, and crumbly, and it would have been nice to dunk it in some whipped cream. The thing I didn't care for was the filling. Oops. Yeah, why did I think I wanted mincemeat? The assorted colored raisins were fine I guess, but, raisins. But the whole thing was heavily orange spiced. Way too much orange for me. But again, um, what was I thinking?